Remember this post from last year? Every summer we get a visit from the local tawny owl. We have a lot of tawny owls in the area. For the last three years there has been a nest in a small copse about a quarter mile from our house. You can year the young owls (owlets?) calling as they start to fly from the nest. 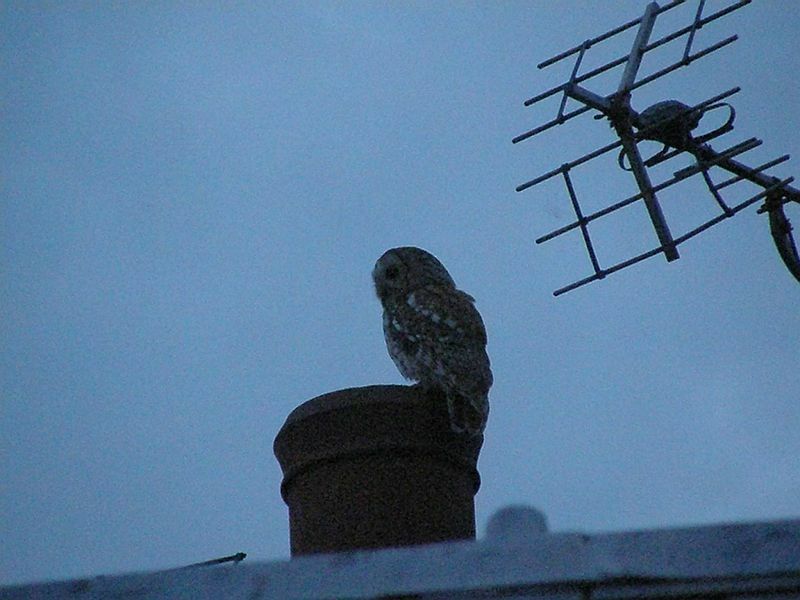 This is a picture of the owl that sat on our roof on June 12th. Looking back through the archives, I note that I had taken similar pictures of the owl on June 12th 2008 and June 2nd 2009. It isn’t a very frequent visitor, and it only seems to come in early June. Clearly an owl of very regular habits! So why does it only visit the house at this one time of year? Is it something to do with having young in the nest? Or is it that I only see it in the long evenings of June? Well, I’m pleased to say that our tawny owl turned up again at 10.00 this evening, a year and a day since it last arrived. We’ve just been outside watching it. This makes it four years of visiting the house in early June. It’s astonishingly regular. If it had been around earlier in the month we’d have seen it, I’m sure. I don’t know why it comes at this time (assuming it’s the same one) but it does show the value of keeping records, if only for curiosity value. I’m just researching owls for an article and haven’t come across this behaviour although the same pair will keep to the same territories year on year. Why June? Why this house? Hoooooo knows. It is odd about the owls. I’m sure it’s something to do with having chicks and having to expand their range to feed them. It turns out that my neighbour is something of an expert on owls, so I’ll ask him at some point and see if I can shed any light on the matter.